Over recent years, a few efforts have been made to paint a genuine Big Picture of the future of our beautiful town of St Peter Port. The most significant was in 2013, when representatives of the Town Centre Partnership and Chamber of Commerce, facilitated by various States departments, produced an impressive document based on the States’ Strategic Land Use Plan, published in 2011. The Chamber sought to revive the plans a couple of years later, but as before, failed to gain much traction beyond some headlines. If you look back further, other big projects have been talked about but seen little progress: Leale’s Yard in the Bridge area, for example, and the idea of reclaiming parts of Belgreve Bay on the east coast, north of Town. Even the big projects which have gone ahead – Admiral Park, for example – have not reached their intended full completion. Only the Royal Hotel site appears to have been finished, and the entrepreneur behind that seemed exhausted by the process. Back in May, when the Committee for Economic Development was unveiling its strategy for the future, committee head Charles Parkinson offered his own take on this particular idea, which was just one of 20. Fearful of managed decline and echoing the need to “re-imagine the future,” he said the harbour was “massively under-exploited,” particularly in respect of its real estate. He talked of regeneration of North Beach and parts of Town, and spoke lyrically of a marina, lagoon and tidal barrage using Belgreve Bay. In quick reaction, an exasperated Deputy Peter Roffey said it was hard to know where to start responding except to say, “I hope they know when to stop.” Given the existing beauty of the harbour setting, he said, this was “definitely a case of less being more.” And don’t even mention Belgreve Bay. However he did identify a key problem. “We need to stop using these beautiful historic piers as car parks,” he said. It was “a criminal waste” of areas perfect for more pleasurable pursuits. What ought we to make of all this, if anything? The answer, surely – given the time any significant island project takes to come to fruition – is to narrow the waterfront vision down to perhaps two or three projects which, crucially, are feasible in engineering and financial terms and would earn revenues which pay back the investment. 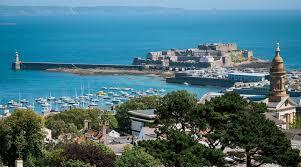 Start with Castle Cornet. The idea that a hotel be developed on the site is now well-known, but few details have ever surfaced. One suggestion is that the hotel should be a professionally-managed equivalent to the Paradores del Tourismo in Spain, a chain of luxury hotels located in castles, palaces, fortresses and convents – that is, historic buildings which are part of the country’s heritage. These entities remain owned by the state and enjoy unique locations where there is no competition. An optional refinement in the case of our Castle is that the development should include a casino – again with the aim of protecting the heritage, not emasculating it. Either way, all profit goes towards the upkeep of the site. Second, the Crown Pier (also known as the Victoria Pier) should become a significant pedestrian hub, anchored with a select restaurant in an iconic building at its far end. To assist this zone’s success, perhaps the Harbour Pool beyond could offer deeper-water mooring for larger seacraft, with better direct access to the pier (matching what is already available to those mooring in the existing Victoria marina). An engineering solution to ensure weather protection in the harbour waters ought to be possible – and wouldn’t require planning permission. Last, have a competition among architects to determine what to do with the rather tired building which currently houses the Border Agency, Passport office and main passenger ferry terminal. The idea here is that it should be replaced, and in its stead there should be a purpose-built modern terminal for ferries to the mainland, France and the other islands, and to collect and despatch passengers from visiting cruise liners. Perhaps we could renovate the Harbour Offices in the process. — Each of these projects would be revenue-earning once complete. Being unconnected, the work could be phased in sequence to rationalise public costs. With no fantasy “Vision” at stake, we could if we wished re-assess things at each phase. — Not initially included is any terminal for cruise liners. The opinion here, based on experiences in places like Bermuda, is that cruise liner passengers do not bring in sufficient revenues to justify such a construction. If the amount charged per passenger was significantly higher, the business case might be sounder. — Also not initially included is the re-development of the QE2 Marina car park, another common suggestion. But this might be justified if the right project could be found, and if the island’s leaders agreed that paid parking in the area was required – a political hot potato. One suggestion might be that the current car-parking area be taken underground, engineering considerations permitting. Then, above ground could be the single amenity most missing from Town, a proper public auditorium, with room nearby for ancillary public assembly spaces, shops or other civic amenities. None of this can happen without agreement on additional infrastructural development to give easy access to the sites. This means arrangements to handle traffic and protection from the elements. Indeed, without such measures the maximum rebalancing of the waterfront probably cannot occur. The idea should not be to eliminate traffic, just to reduce it so that it is no longer overwhelming. If the various developments described here were unfolded in phases, the associated changes in parking, bus terminus arrangements and overall road systems might be manageable. The ultimate aim would be to reunify the harbour with the town, and to take a cue from cities like Rennes, Bordeaux and Strasbourg which have smart public transport, beautiful public areas and cars tucked underground. If we don’t seek such solutions, visitors will think Guernsey is living in a past age, of road congestion and poor public spaces…and shuttered retail. The people who talk of these civic developments point out that, down the decades, Guernsey has filled in the Braye, expanded the harbour and marinas, built a road up the Val de Terres, and constructed a reservoir and an airport. Where would we be, they ask, if those who didn’t think these projects were worth doing had won the day.